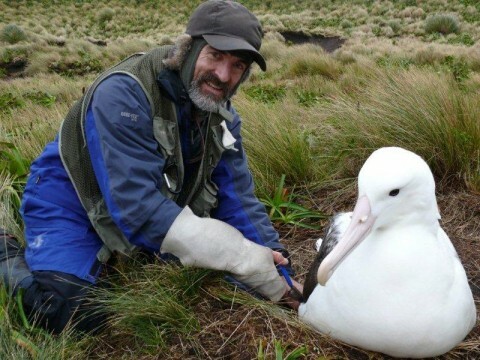 Peter Moore studied southern royal albatrosses on Campbell Island for many years. Here, he talks about his experience and gives you an idea why this handsome ocean wandered deserves your vote for #BirdOfTheYear. I was fortunate enough to spend several field seasons on Campbell Island over a 22-year period, and never lost my awe of Royal Albatrosses’ incredible powers of flight. As they make a low pass over a ridgeline, they seem to me to be the Jumbo Jet of the bird world, and you feel dwarfed by their size and magnificent 3.5m wingspan as they pass you at eye-level. Of course, landing can be precarious at times, and I have seen some face-plants when they didn’t have the benefit of a good head wind to slow down! Although they might seem a bit ungainly on land, they are actually quite determined walkers and can travel quite a long way to their nests from a good landing site. Their great powers of flight serve them well as they roam NZ’s waters’ searching for their favourite squid and fish diet, and in their non-breeding and juvenile phases they travel all the way to South American waters. Caption: Peter Moore banding a southern royal albatross on Campbell Island. It’s only when you see a person next to an albatross that you realise quite how big they are – and that’s with its 1.5 metre long wings tucked away! They are a little like people in some ways – they are long lived (40-60 years plus), and have long-term partners, although they will divorce if their mate does not work out for them. They are devoted parents – both males and females share in incubation and chick rearing, the whole process taking almost a year before the chick fledges, which means they must take a year off before their next breeding season. One of the most interesting displays are the gamming rituals, where young birds gather in groups to check each other out. There is lots of screaming, calling to the sky, clapping of bills, spreading of wings, pecking, nibbling and little altercations, and a constant dropping in and leaving of other birds – all fascinating to watch.